I prefer a leaner pork but feel free to substitute with pork belly. Chicken thighs are also a tasty alternative to pork. Optionally, skip the meat altogether and just use a whole shrimp. These dumplings are bite-sized so there’s not a lot of shrimp and pork in them. Use the smallest fresh shrimp you can find. I use size 71-90 and cut them in half. If using larger shrimp, cut them into thirds to make them smaller. The dough can be a bit tricky to make and the timing is very important. Make sure the heat is on Low so the starch mixture doesn’t heat up too quickly. As soon as you see small tapioca lumps forming, remove from the heat right away. If you let the tapioca mixture cook for a bit too long, it will quickly turn into a really thick dough and it will not be useable. If you want to make a double recipe and it’s just you cooking, prepare one batch of dough and make the dumplings. Then prepare a second batch of dough and make the dumplings. Do not make a double batch of dough at once because once the dough gets cold it becomes less pliable and tougher to spread. Use approximately .4 oz – .5 oz of dough per dumpling which yields 36-45 dumplings, respectively. Boil the dumplings gently. Boiling vigorously may cause the parchment paper to detach from the dumpling. The cooking time is the same whether boiling or steaming – just 10 minutes. If you would like the dumplings less chewy, add 3 Tbsp rice flour + 2 Tbsp cold water to the dough recipe. The dumplings won’t be translucent but they will be delicious! If you love the aroma of banana leaves, use them instead of parchment paper. Refrigerate any remaining dumplings and consume within the week. 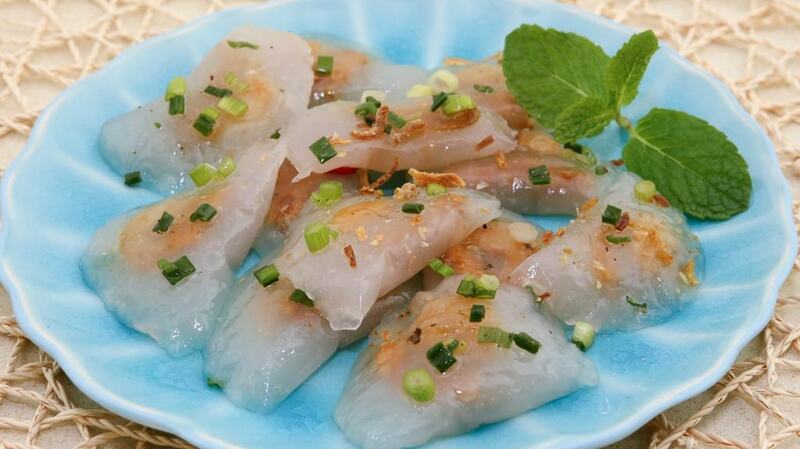 If you enjoy this recipe, you make also like: Steamed Rice Cakes and Pork Roll (Banh Day) or Sticky Rice and Mung Bean Dumplings (Banh Khuc). Cut the pork into thin slices about 1/4-inch thick and then into 3/4-inch strips. Place into a small bowl. Cut the shrimp in half and place into a separate bowl. Peel and mince the garlic. Finely dice the shallot. Marinate the pork by combining 1/4 of the minced garlic, 1/4 of the diced shallots, 1/4 tsp sugar, 1/4 tsp paprika, 1/4 tsp fish sauce and 1/16 tsp ground black pepper. Allow to marinate for 15 minutes. Marinate the shrimp by combining 1/4 of the minced garlic, 1/4 of the diced shallots, 1/4 tsp sugar, 1/8 tsp salt and 1/16 tsp ground black pepper. Allow to marinate for 15 minutes. Heat a wok or skillet over Medium High heat. Add vegetable oil and 1/2 tsp sugar. Cook for 10-15 seconds or until the melted sugar just starts to turn golden. Add the remaining minced garlic and diced shallots and stir-fry for 10-15 seconds. Add the marinated pork and stir-fry for 3 minutes. Add the marinated shrimp and stir-fry for 2 minutes. Add a few more dashes of paprika and combine well. Transfer to a plate and allow to cool. Cut parchment paper into 4-inch squares, making a total of 40 squares. In a medium-sized saucepan, add the tapioca starch, salt, vegetable oil and cold water. Whisk together until the starch is dissolved. Warm the starch mixture over Low heat stirring continually. When the starch mixture starts to turn lumpy and sticks to the bottom of the whisk (approximately 5-6 minutes), remove from the heat and continue whisking quickly. Continue whisking for 1 minute allowing the starch to thicken into a cake-like batter. Return the saucepan to the stove over Low Heat. Continue cooking and stirring for another 1 minute or until the dough thickens into a pudding-like consistency. Transfer to a bowl and allow to cool for 5 minutes. Place a parchment square on the work surface. Spoon out approximately 2 1/2 tsp dough and spread on the parchment paper making a circle approximately 2 1/2-inches in diameter. In the center, add 1 piece of shrimp and 1 piece of pork. Fold the parchment square in half so the dumpling is now a half circle. Press gently along the edge to seal the dumpling. Use a small glass, dish or cookie cutter to shape the dumpling further into a half circle. Continue making the dumplings until all the ingredients are used. Bring a large pot of water to a rapid boil and then reduce the heat to Medium. Add half of the dumplings to the pot and boil gently for 5 minutes. (The dumplings will float to the top.) Rotate the dumplings and boil for another 5 minutes. (Total boiling time is 10 minutes.) Transfer the cooked dumplings into a large bowl filled with ice water and allow to soak for 2-3 minutes. Transfer the dumplings to a colander and allow to drain for 5 minutes. Repeat the same steps to cook the remaining dumplings. To make the Scallion Oil, chop the green onions and transfer into a microwaveable bowl. Add the vegetable oil, salt and pepper and toss together. Microwave on High power for 20 seconds. To serve, brush some oil from the Scallion Oil onto a plate. Peel back the parchment paper and transfer the dumplings onto the plate. Top the dumplings with the Scallion Oil and fried onions. Serve with a side of the Fish Sauce Dipping Sauce. Freeze the uncooked dumplings to enjoy at a later time. I store them inside a re-sealable plastic bag. Thank you for sharing your knowledge with us! I was always wondering, how are those translucent dumplings are made, and now I know. It is a lot of labor, lol. But worth every bite! I have learned so much already about dishes and techniques. Thank you again, Trang. The last time I used your recipe, they were very clear and tasted nice. But the only problem I had was the banh bot loc slided out of the parchment paper and it broke apart (filling spilled out into the boiling water). I think I have the same problem like Jackie mentioned. It’s not completely ruined but some of them are like that. Also, the skin is quite thin to hold the filling. Should I reduce filling or make thicker skin? Hi Trang! I love your website and have made a few recipes, including banh bot loc, so far! It came out pretty great for a first time attempt! Thank you for such a great recipe. 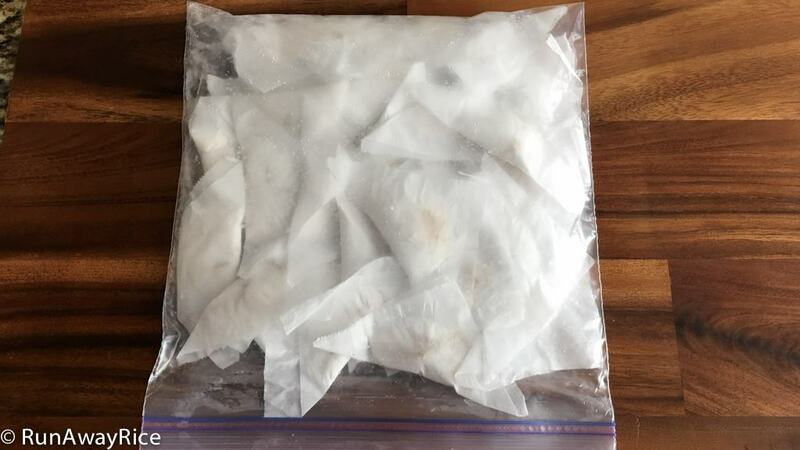 I have a question … I froze the leftover dumplings in a resealable bag and attempted to make a batch to eat for dinner on another day. However, I noticed that most of the dumplings would slide off the parchment paper and into the water while being cooked and thus the dumpling was ruined. Am I doing something wrong? I am not sure I understand why the dumpling was “ruined”. Some parchment paper may fall off but that shouldn’t prevent the dumpling from cooking properly. It is awesome idea to use parchment paper to form the dough. I love this dumpling but don’t like to make them because with the old way, you have to pour the boiling water straight to the tapioca flour, and kneed with your hand, well that was long time ago, I will try to use parchment paper this weekend. Happy New Year! I am glad you like my method of using the parchment paper. Let me know how it works out for you. I’ve been following and love your blog chi Trang! This is my favorite Vietnamese dish! I can’t wait to try! This is a favorite at my house and it seems I can never make enough. I make as much as I can and then freeze the dumplings. Good Luck with the recipe. I hope you enjoy it! So lovely for banh loc tran. Thank’s for posted. Have a wonderful Thanksgiving to Trang. Will try in this holiday. Thanks Lynn! 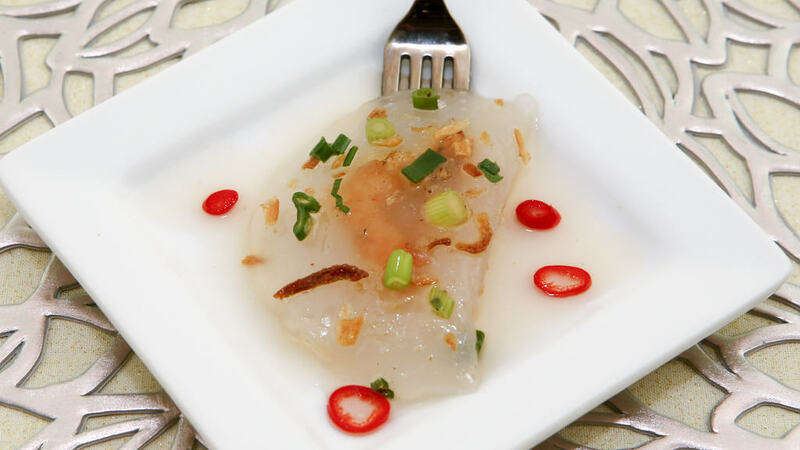 I like to serve Banh Bot Loc around the holidays because it’s small and great for guests to nibble on. I hope you give the recipe a try and stop back to share your results. Have a wonderful Thanksgiving with your loved ones!